It is indeed a happy occasion for me to be present here this evening to inaugurate a new Advanced Crude Oil Research Centre at the Indian Institute of Petroleum (IIP). As I entered this Institute, I was reminded of my visit in 1996 as the Chairman of the Parliamentary Committee to review the findings of herbal fuel investigated by IIP. This Institute was set up in 1960 to pursue research and development for the downstream oil industry. It is an important constituent of the Council of Scientific and Industrial Research (CSIR). I thank Dr. M.O. Garg, the Director of the Institute, for giving me this privilege to share some of my perceptions with this very distinguished gathering. I take this opportunity to pay my respectful homage to Dr. Shanti Swaroop Bhatnagar. With the full support of Pandit Jawahar Lal Nehru, he created CSIR and established a chain of thirty seven national laboratories to carry out cutting edge research. I fondly recall my association with CSIR when, as the Finance Minister, I was a member of the CSIR Society. I remember having heard presentations about CSIR and the wonderful work that it has been doing for the scientific advancement of our nation. In the last more than fifty years, CSIR has spearheaded the development of scientific and industrial infrastructure in our country - from tractors to leather products, chemicals, petrochemicals, healthcare, energy, food, water and strategic sectors. CSIR has been fully forthcoming in its duty towards our nation. I am particularly pleased with their efforts at assisting the people affected by the recent unprecedented disaster in Uttarakhand. I thank CSIR for taking the initiative to pool products, technologies, resources and knowledge of all its laboratories to provide basic amenities such as potable water, high energy foods, non leather footwear and temporary shelters to the distressed people. Ladies and Gentlemen: In today’s context, the importance of energy and energy security is paramount. With rising crude oil prices, depreciating domestic currency and increasing oil imports, we stare at an acute prospect of having to incur huge foreign exchange outgo to buy expensive energy. Energy security has become synonymous with national security. It has been projected that by 2030, we would have to meet 90 per cent of crude oil, 60 per cent of natural gas and 57 per cent of coal requirements through imports. I am yet to hear a debate by our scientists and technologists as to how our country can become self-sufficient in energy. Even the more optimistic experts point out that India has insufficient energy resources. A few years ago, a similar debate was heard in the US. But US has proved everyone wrong as it has turned itself from being a huge net energy importer to being self-sufficient through the discovery of shale gas. This has been possible because of a crucial technological breakthrough in efficient recovery of shale gas. Technology commands enormous power to effect major transformation. Many relatively weak countries have transformed into emerging economies within a short span of time on the strength of technology. Science and technology is duly recognized as the vehicle to take India into the front ranking nations of the world. We have to make the forces of science, technology and innovation partners in our progress. Our future development depends on our ability to devise efficient processes for the industrial sector and better solutions for governance. Though innovation is a long standing feature of our civilization; though there is no dearth of ingenuity in our people; we today lag behind the advanced nations in innovation activity. A new Science, Technology and Innovation Policy, adopted this year, seeks to mobilize all forces for India’s transition to a knowledge powerhouse. Our innovations should aim at converting knowledge into economic wealth and social good. They should lead to the development of technologies that help the common man. Please remember Albert Einstein’s observations and I quote a few lines: "Concern for man and his fate must always form the chief interest of all technical endeavors” (unquote). It is heartening to note that CSIR has started a mission called CSIR-800 to develop technologies, products and services for the benefit of the poor. In my recent Address to the Nation on the eve of the Independence Day this year, I had mentioned that the balance between man and nature must be maintained. The recent deluge in Uttarakhand is a wakeup call for all of us. We need energy to sustain growth but it has to be ecologically safe. It also has to be affordable for our countrymen. These are the defining parameters for developing future technologies. These are stiff challenges indeed; but they are also exciting opportunities for our research community, including the scientists of this great Institute. During my visit to the Advanced Crude Oil Research Centre today, I was glad to observe several eco-friendly innovations, particularly the technology to convert waste plastic to fuel and for making jet fuel from non-edible vegetable oils. IIP is a front ranking research institution of our country. It provides technological assistance to the hydrocarbon industry. It has core competency in the evaluation of crude oil feed stocks. The detailed hydrocarbon analysis carried out by the Advanced Crude Oil Research Centre of the Institute are used extensively in the pricing of crude oils; transportation and absorption of new crude in refineries; designing new refineries; and expanding existing ones. It is a matter of pride that this laboratory has till date evaluated more than five hundred crude oils. This has immensely boosted domestic refining capabilities. I am told that the crude from Mumbai High region, which initially posed a difficulty in transportation, later became a sought after source for many refineries after extensive finger printing carried out at this laboratory. The domestic oil sector has been the beneficiary of this laboratory’s profound expertise and experience. The commendable performance of this laboratory has raised the expectations of the industry. As the oil sector in our country develops further, it will be required to process heavier and more complex crudes. A new Advanced Crude Oil Research Centre at the IIP, which has the latest infrastructure for finger printing of crude and allied products and for exploring innovative ways to develop future fuels, will help meet our requirements. I am confident that it will serve its intended purpose of providing critical assistance to the oil industry and supporting the technological ambitions of our nation. Great institutions make a great nation. 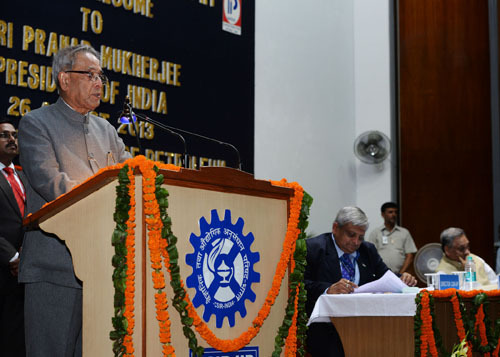 Our visionary leaders laid the foundation of great institutions like Indian Institutes of Technologies, Indian Institutes of Managements and a huge network of national laboratories including CSIR laboratories. It should be your endeavor to make this Institute world class. Research institutions in the energy sector have a responsibility to develop cutting edge technologies to make our industry globally competitive. Remember that a country like Japan, who is completely dependent on others to meet their energy requirements, is an exporter of high-end technologies. We as a nation must achieve technology security. You have a big contribution to make to turn this vision into reality. Complement your efforts by pursuing knowledge networking across the scientific community. I wish the scientists present here all success in their future endeavours.